The rules of entertaining suggest that when you’re welcoming the chaos of small children and adults thirsty for bubbly (ample quantities necessary for preserving sanity) recipes should be tried out in advance. I’m generally a slightly anxious baker because the measurements and methods have to be so precise. Yet for my son’s second birthday party I ignored the rules twice, using other peoples’ recommended recipes for both a cake and cupcakes. Luckily they both turned out alright. 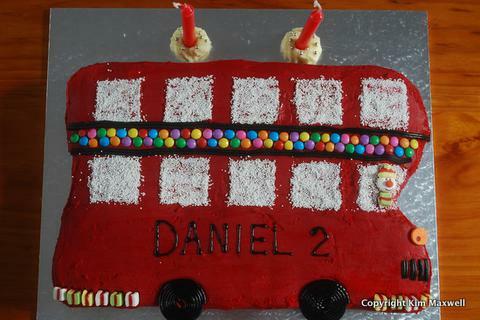 Daniel, turning two, was so delighted with both the cupcakes and his red bus cake that I decided to post the cake recipe here. He is obsessed with buses and regularly points out Cape Town’s red Hop On red bus. And riding the MyCiti bus around the CBD is always a hit. For the bus cake, I bought a large cake tin (future birthdays?) because I enjoy the creative process of decorating. 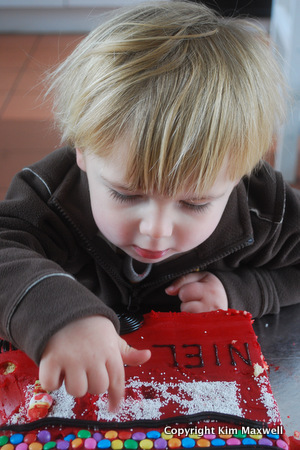 Baking in a cardboard beer box is a clever, inexpensive alternative. Preheat the oven to 180 degrees celcius and line the baking tin. Boil or microwave the water, oil, cocoa (or flour) and vanilla essence. Cool for about 20 minutes. If using cocoa, strain the mixture. 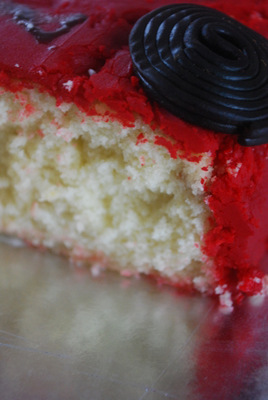 If making a vanilla cake with 6 Tbsp extra flour, don’t strain but add a dash of almond essence. Beat eggs and castor sugar well until thick and creamy. Add sifted flour and baking powder, folding in gently. Carefully add the chocolate (or vanilla) mixture and fold in with a metal spoon. Be careful not to overmix. Pour into the lined tray. Bake for 30 to 35 minutes. Using the 24 x 36cm tin I had to bake the cake another 10 to 15 minutes longer, checking it at 5min intervals. 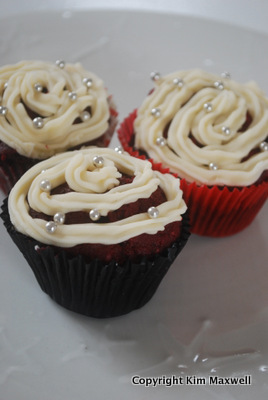 Talented food stylist Sam Linsell provided the recipe for my delicious red velvet cupcakes. It was my first attempt and I’m pleased they produced fairly droolworthy results. Sam even dropped off her last bottles of Moir’s crimson red food colouring when I cried for help after two branches of Pick n Pay were inexplicably out of stock.